The bomber will take off from a normal home airfield to patrol Russian airspace. Upon command, it will ascend into outer space, strike a target with nuclear warheads and then return to its home base. 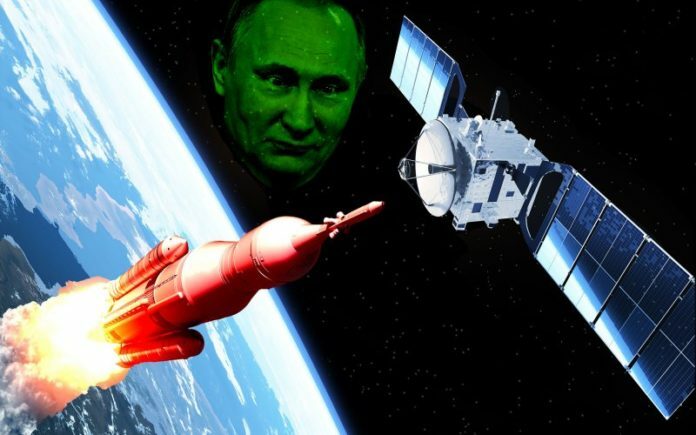 Source: Did Russia Just Test a Weapon in Space? In July 2016, Lieutenant Colonel Aleksei Solodovnikov, a rocketry instructor at the Russian Strategic Missile Forces Academy in St. Petersburg, claimed that the Kremlin was developing a hypersonic strategic bomber capable of striking with nuclear warheads from outer space. The trial model of Russia’s nuclear-capable outer space strategic bomber will be developed (with help from Moscow’s Central AeroHydrodynamic Institute or TsAGI) by 2020. “The idea is that the bomber will take off from a normal home airfield to patrol Russian airspace. Upon command it will ascend into outer space, strike a target with nuclear warheads and then return to its home base. “We are cooperating with Russia’s Central Aerohydrodynamic Institute on the design of an airframe and the aircraft’s characteristics. I think that its lift-off mass must be 20-25 metric tons for it to be a strike aircraft. It will be able to accelerate to hypersonic speed (around 3,800 mph) in rocket mode… and reach any point on Earth in under two hours (flying at five times the speed of sound). Colonel-General Sergei Karakayev, commander of the Russian Strategic Missile Forces, confirmed that the model engine for the bomber had been built and successfully tested at the Serpukhovo branch of the Military Academy. He also confirmed that Russia planned to exhibit the engine at the Army-2016 International Military-Technical Forum in September, in Moscow. “An engine for a promising space plane has been developed at Strategic Rocket Forces Academy. The unit’s operational ability had been proven. Right now we are reviewing the nuances, which will take approximately one year. Then we will make a blueprint, which could be completely different from the current one. 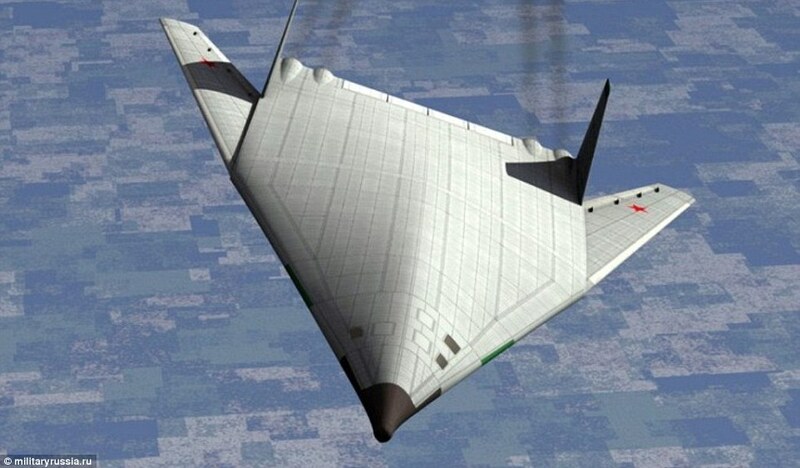 Called the PAK-DA stealth bomber (which stands for Prospective Aviation Complex for Long-range Aviation), the hypersonic aircraft – which will be invisible to radar — was being developed by the Tupolev Design Bureau, designers of the infamous Tu-95 ‘Bear’ strategic bombers. 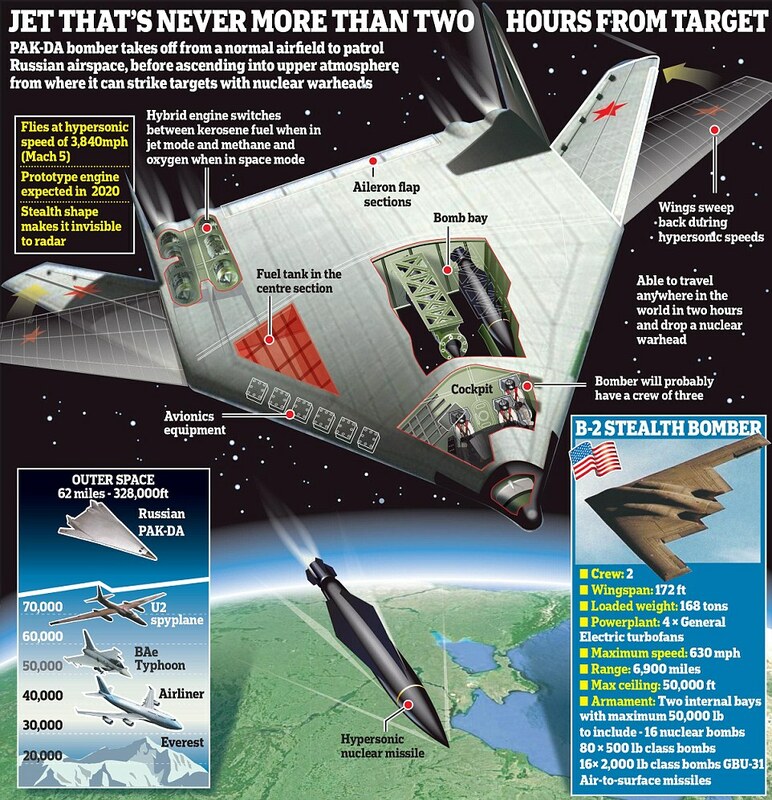 It was described as a stealthier version of the TU-160 hypersonic bomber, and as a counter to the US Air Force’s in-development B-21 stealth bomber. Interestingly, in October 2016, the Russian Defense Ministry announced PAK-DA (which may be unveiled to the public by the end of 2018) is set to replace the current fleet of Tu-160, Tu-95MS, and Tu-22M3. According to a report in RT, the new stealth bomber is expected to cover a range of 6,740 nautical miles and carry around 30-40 tons of weapons, including air-to-surface and air-to-air missiles, as well as conventional and smart-guided bombs.